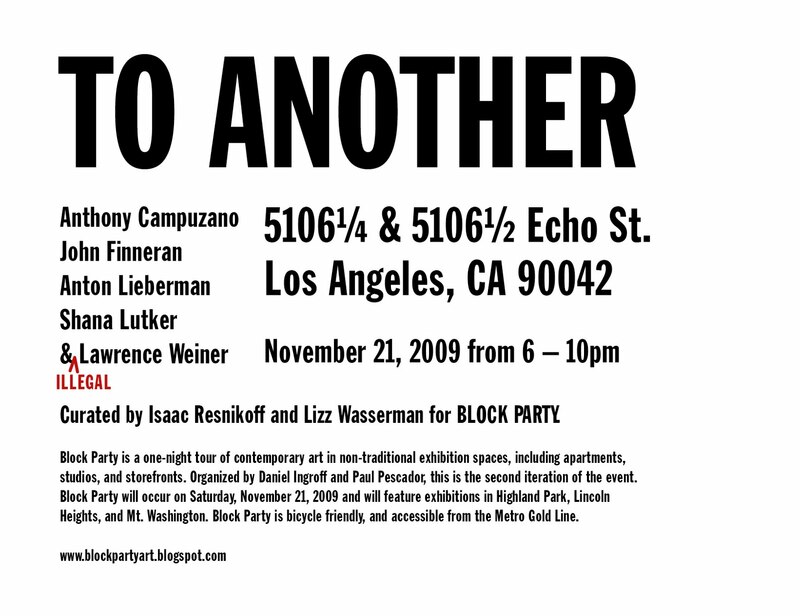 Curated by Isaac Resnikoff & Lizz Wasserman in their home as part of BLOCK PARTY, "AN OBJECT TOSSED FROM ONE COUNTRY TO ANOTHER" looks at the moment of transition from regular stuff into artwork that all artworks (however different they may be otherwise) in some way share. It is our hope that this inquiry could begin to point at a sort of "pure language" with which to navigate a pluralistic art landscape. 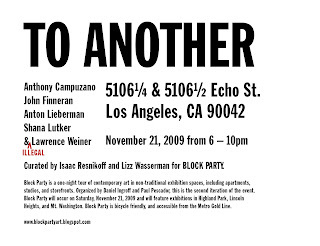 The show takes it's name from a public-freehold Lawrence Weiner piece, an unauthorized version of which will be executed for the exhibition. 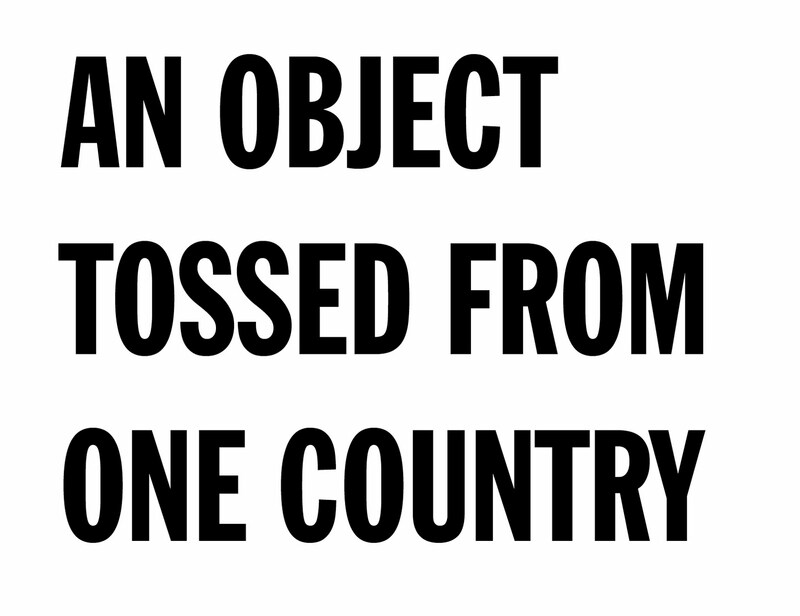 In this case the piece, in it's physically enacted form at least, would have a literal moment – as the object in question crossed the border – when it became an artwork. In addition to the clarity with which this piece demonstrates it's transformation, it also contextualizes this transformation poetically as a crossing of borders, both physical and political. It seems, for these reasons, an excellent starting point for the show. 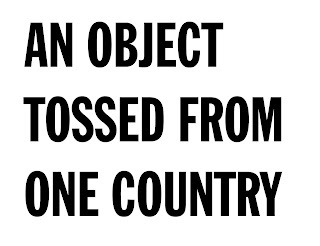 Because this particular instance of the piece is unauthorized — and therefore perhaps not an artwork at all — it further illuminates the question of our show: Where (and when) is the border between the Country of Stuff and the Country of Artworks? In Shana Lutker's work this alchemy is psychological. We first discussed this show with Lutker with an eye to her dream pieces, particularly the sculptures of sculptures she'd dreamt she'd made. We were interested in the way in which they seemed to fluctuate between artworks and descriptions of artworks, and the way in which this positioned them precisely on the edge of transformation. The works we ended up including, the works which haunted us from our first meeting, are simpler in a way: photographs of sculptures of temporary containers (cardboard boxes, wine bottle dividers, packing peanuts). But they remain very much on the cusp of becoming, as though the photograph recorded the exact second of it's passage. Like a photo-finish, or a subway reminder to mind the gap. John Finneran's paintings, of eyes and noses and mouths etc., have a similarly transitory quality. His recent works have been in two modes - light paintings and dark paintings. Both have a way of hovering in irresolution (the latter by way of an obscuring darkness, the former by being as yet unimagined) but they each seem to pull the space of the painting in opposite directions (the darkness pulls back, the light paintings sit behind your eyes). The actual surface of the work, then, on which the paint actually sits, becomes itself a border, over which the paintings of both modes must cross in order to become. Anton Lieberman makes fragile, ingenious sculptures with found materials. There is a provisional quality to them which makes the time you spend with them seem specific. But what drew us to this piece in particular (a log, in which a neon tube has been set, which floats on clear plastic water bottles) was the clarity of it's decision making. Without any one of the simple gestures of which the piece is constructed it could not have worked. It might not even have been an artwork at all and would certainly have been no good. But the delicacy of it's balancing act, both physically (on bottles) and conceptually (of formal decisions) allows the piece to teeter on the edge just so, a perfect alchemical object lesson. For Anthony Campuzano, on the other hand, the transformation is harder to pin down. You have a sense of it while looking at his densely scribbled drawings, but there has been so much labor, so much thinking and rethinking, that it becomes difficult if not impossible to say when the piece became an artwork. If there is a way to identify the transition, and we think there must be, it is through the physicality of the drawings, through their indexical relationship to Campuzano's knuckles and calluses and colored pencil shavings. The crucial moment, in this case, seems to hang in the air between the objects and their maker, as though the drawings were a plaster cast of the negative space between the artist and the artwork. 5106 1/2 & 5106 1/4 Echo St.
From the 110 freeway exit at Ave 52. Drive north on Ave 52 to Echo St. Turn left at Echo St. Street parking is available.